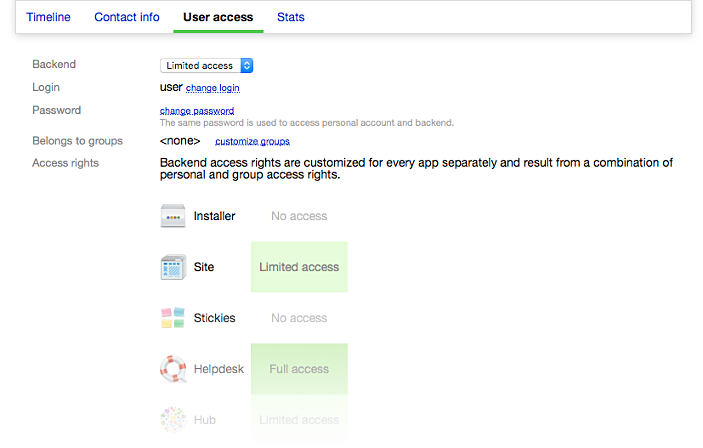 For setting up access rights of Webasyst users in Team app, open “Access” section. 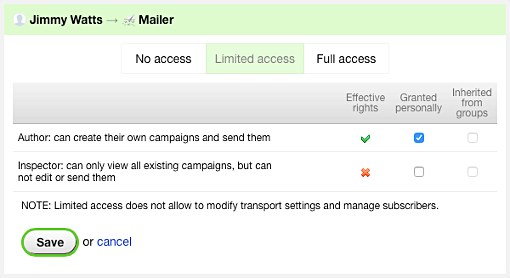 Choose whose access rights you want to edit: an individual user or a group. In the settings table, click the cell accross the desired app name in the selected user's or group's line. Select one of the available access levels and save the changes. You can also set up access rights for a user under the “User access” tab in their profile. If a user is included in one or more groups, then their personal access rights are summed with the access rights of all their groups. Suppose that some user has access to Mailer app. That user is also included in a group which has access to Site and Blog apps. As a result, the user will have access both to Mailer, and to Site and Blog. Other members of that group, if they have no personal access rights, will have (group inherited) access only to Site and Blog, and not to Mailer. In the situation described in the previous example, the user is added to one more group, which has access to Hub and Photos apps. In this case, the user, being included in 2 groups at once, will have access to all those apps, i.e. to Mailer (due to personal access rights settings), to Site and Blog (inherited from access rights of group #1), to Hub and Photos (inherited from access rights of group #2). If a user is included in groups and has personal access rights set up, those access settings can only extend and not restrict each other. For example, if group access settings allow access to an app, personal settings cannot restrict user’s access to the same app. if you need to restrict a user access to an app, remove that user from all groups allowing such access and disable access to the app in their personal access rights setup.